Lasers are one of the newest tools used in dentistry. With a limited number of applications and research continuing, it is certain that their role in your dentist’s repertoire will increase in the future. Although lasers cannot be used exclusively to replace other tools in the dentist’s office yet, they can be used in a wide variety of situations. There are different kinds of lasers and each seems to work better for different treatments. For example, different lasers have different wavelengths, and one may be better for treating soft tissue like gums, and another for removal of decay before fillings can be done. Some can be a heat source, and some may be used as a cutting agent. The learning is continuing. 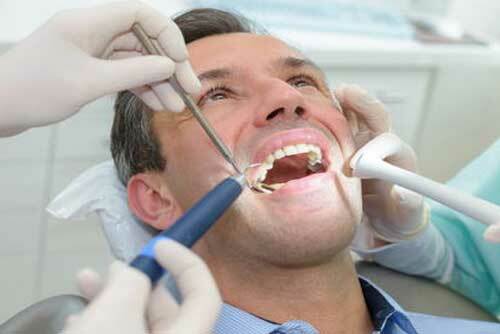 Your dentist can use lasers for several everyday problems, like when they discover tooth decay. Not only can a laser remove the decay from the tooth, it can help prepare the enamel for the filling. The FDA approved lasers for use on gums in the early 1990s and they have proven useful in the treatment of root canals. Because of their cutting ability, lasers can help when a biopsy is needed by removing tiny amounts of soft tissue. They can also relieve the pain of canker sores and remove lesions. During a teeth whitening treatment (discussed elsewhere on this site) the heat from lasers can be used by your dentist to speed the whitening process of the peroxide solution. Remember, the development of laser usages in the dental office is still in its infancy. As more studies and tests are done, it is likely that you will see more of this technology, making things easier on both you and your dentist. First, when preparing cavities for filling, the lasers seem to be more comfortable than drills and less anaesthesia may be used. With less pain comes less anxiety on your part. In contrast to using a traditional drill, less tooth may be lost in the process. However, lasers cannot be used on teeth that already have a filling, and some other situation. And, the cost to the patient is higher.